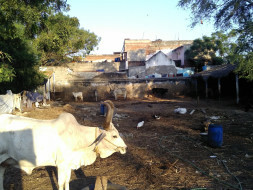 I kindly request you all to consider helping build a shelter for the temple cows that are rescued from slaughter. 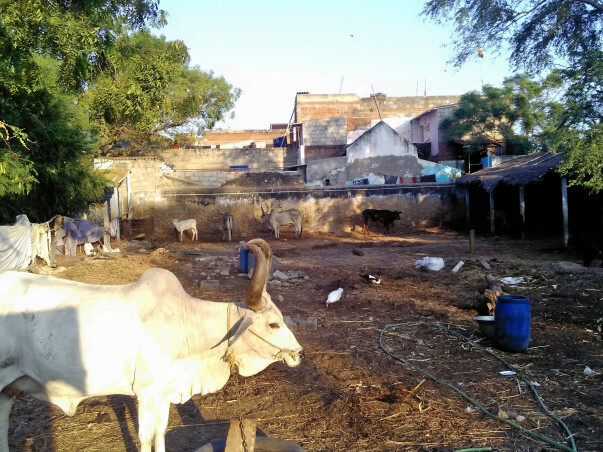 Though the cows have been rescued from slaughter they are staying in an empty land with no roof on top, having to face severe heat during this hot summer. There was a small thatched roof/shed that existed before but it fell away due to rains and feeble material quality. There are a couple of trees in the empty land but that cannot accommodate around 50+ cows. During summer the cows have to bear the heat and during rains the cows have to be drenched all the time. With public support we started building a shelter home and made good progress in cleaning up the debris, completing the foundation, walls, installing poles, pillars, windows, food tanks, built a space for cows to freely move, etc. However we are falling short of Rs. 3 lakhs ($3800 approx) to complete this project. The outstanding part is to complete the roofing and the flooring inside the shed. The pictures have been posted below so you can see the before state and the current state. These cows are native breed variety (rare ones) that were rescued from temples (Divya Desams) before being sold for slaughter. This Gosala (CKR Shankaar Gosala) is in Thoothukudi, Tamil nadu, India. The contact & account info. has been provided below.